South Palm Beach is a town located in Palm Beach County, Florida, United States. The town is situated on a barrier island between the Atlantic Ocean and the Intracoastal Waterway. The entire town is approximately 5/8th of a mile (1 km) long along South Ocean Boulevard (Florida State Road A1A), its only street, and is bounded by the Town of Palm Beach to the north, and the Town of Lantana public beach to the south. As of 2013, the population recorded by the U.S. Census Bureau was 1,138. South Palm Beach is located at 26°35′30″N 80°2′15″W﻿ / ﻿26.59167°N 80.03750°W﻿ / 26.59167; -80.03750 (26.591746, -80.037525). South Palm Beach is bordered to the north by the Town of Palm Beach; to the east by the Atlantic Ocean; to the west by the Intracoastal waterway (known locally as the Lake Worth Lagoon); and on the south by the town of Manalapan. According to the United States Census Bureau, the town has a total area of 0.9 square kilometers (0.35 sq mi), of which 0.3 km2 (0.12 sq mi) is land and 0.5 km2 (0.19 sq mi) (60.61%) is water. As of the census of 2008 (population updated from 2013), there were 1,138 full-time residents in 453 households and 196 families residing in the town. The population density was 5,204.3 inhabitants per square mile (2,076.0/km²). The seasonal (part-time) estimate for the town is 3,000 or more residents in the winter months. There were 872 housing units at an average density of 6,492.3 per square mile (2,589.9/km²). Currently, the town consists of 25 condominiums, 4 single-family houses and 15 townhouses. The racial makeup of the town was 99.28% White (97% were Non-Hispanic White,) 0.14% Native American and 0.57% Asian. Hispanic or Latino of any race were 2.29% of the population. There were 453 households out of which 2.2% had children under the age of 18 living with them, 38.6% were married couples living together, 3.5% had a female householder with no husband present, and 56.7% were non-families. 52.1% of all households were made up of individuals and 28.5% had someone living alone who was 65 years of age or older. The average household size was 1.54 and the average family size was 2.14. In the town, the population was spread out with 2.6% under the age of 18, 1.4% from 18 to 24, 11.3% from 25 to 44, 30.5% from 45 to 64, and 54.2% who were 65 years of age or older. The median age was 67 years. For every 100 females, there were 75.2 males. For every 100 females age 18 and over, there were 76.0 males. The median income for a household in the town was US$39,375, and the median income for a family was $47,250. Males had a median income of $41,591 versus $30,536 for females. The per capita income for the town was $38,456. About 15.3% of families and 15.7% of the population were below the poverty line, including none of those under age 18 and 15.9% of those age 65 or over. As of 2000, English was the first language spoken by 92.96% of residents, Finnish by 3.90%, and French as a mother tongue made up 3.12% of the population. Palm Beach Oceanfront Inn (2009). The inn was demolished April 2016. Originally built in 1964, the Polynesian inspired, 58-room Palm Beach Oceanfront Inn and its ocean-front restaurant Tides Bar and Grille, located at 3550 South Ocean Boulevard, made up the only commercial business establishment within the town of South Palm Beach. It was described as "one of the last vestiges of old Florida along A1A." Known to locals by its former name, the Hawaiian Inn, the two-story motel lost most of its beach during Hurricane Wilma in 2005 and was not being maintained. A proposal by the Paloka family owned-and-operated Kosova Realty Corporation to replace the inn with a luxury resort-style 12-story condominium-hotel built over two stories of parking was unanimously rejected by the Town Council in October 2007. The established comprehensive plan limits new buildings to six-stories over one-level of parking. On September 18, 2009, the Treasure Coast Regional Planning Council meeting expressed concerns about the redevelopment and recommended that the Town of Palm Beach should respond to negative opinions by its citizens prior to adoption of the amendments, as well as ensure that development approval conditions address problems with the use, height limits, and negative impacts on the beaches. In November, the operation was purchased by Paragon Acquisition Group of Boca Raton, a distressed property development company, with plans to improve and revive the facility, as well as "possibility of a development project in the future." The purchase price for the 1.1-acre (0.4 ha) site was $24.25 million and although the property has received minor renovations and is being managed as a hotel and restaurant, the long-term prospects for it are for condominiums according to the CEO of Paragon. The current zoning for oceanfront property in the town allows 33 units per acre, while a more dense project would require a referendum. Plans have been announced for 30 residential units to be built above a one-story parking garage. The old motel and restaurant on the site were demolished in April 2016. ^ a b "Town of South Palm Beach Florida". Town of South Palm Beach Florida. Retrieved 19 December 2012. ^ "Table 4: Annual Estimates of the Population for Incorporated Places in Florida, Listed Alphabetically: April 1, 2000 to July 1, 2004". U.S. Census Office. Archived from the original on 22 July 2007. Retrieved 23 August 2013. ^ "Census of Population and Housing". Census.gov. Archived from the original on 12 May 2015. Retrieved June 4, 2015. ^ "Demographics of South Palm Beach, FL". MuniNetGuide.com. Retrieved 23 August 2013. ^ "MLA Data Center Results for South Palm Beach, Florida". Modern Language Association. Retrieved 23 August 2013. ^ Rogers, David (30 October 2007). "South Palm Beach board to tackle Oceanfront Inn plan". The Palm Beach Daily News. Archived from the original on 17 November 2007. Retrieved 19 December 2012. ^ Salisbury, Susan. "Former Palm Beach Hawaiian Ocean Inn to be razed for six-story condo". The Palm Beach Post. Retrieved 29 November 2018. ^ Felker, Chris (1 October 2014). "South Palm Beach: Locals say aloha to former 'Hawaiian' Inn". Coastal Star. ^ Kacoha, Margie (1 November 2007). "South Palm Beach rejects plan to redo inn". The Palm Beach Daily News. Archived from the original on 17 November 2007. Retrieved 19 December 2012. ^ Treasure Coast Regional Planning Council (18 September 2009). "Draft Amendments to the Town of South Palm Beach Comprehensive Plan DCA Reference No. 09-1" (PDF). Retrieved 19 December 2012. ^ a b Miller, Kimberly. "South Palm Beach oceanfront hotel sells for $8 million". The Palm Beach Post. Retrieved 29 November 2018. ^ O'Meilia, Tim (December 2012). "New inn owner wants 'neighborly' update to hotel". The Coastal Star: 10. ^ a b Smith, Jane (January 2014). "Hawaiian' sees upgrades under new owners". The Coastal Star: 23. ^ a b Doris, Tony. "Aloha to good times; former Hawaiian Inn demolished". The Palm Beach Post. Retrieved 29 November 2018. ^ Clough, Alexandra (16 May 2016). "New luxury condo to rise in South Palm Beach". Palm Beach Post. 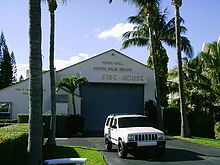 Wikimedia Commons has media related to South Palm Beach, Florida.